Snickers are one of my all time favorite candy bars. Peanuts, nougat, chocolate and caramel… all ingredients for something awesome… which is exactly what this recipe is! The nougat layer blows this recipe out of the park. It really gives it the Snickers flavor. This dessert is perfect for impressing a crowd. It is sweet, rich and packed with everything you love about Snickers! 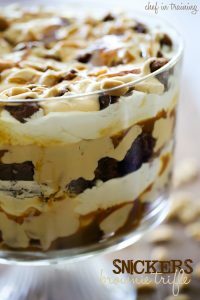 If you love snickers, then you will love this trifle! Chocolate, nougat, caramel, peanuts.. all ingredients for delicious! 1 (9x13) pan of brownies, cut into a ½ inch squares. I use this recipe. Set aside ½ inch squares of brownies. Melt butter over med high heat. Add milk and sugar and bring to a boil. Cook for 5 minutes, stirring regularly. Remove from heat and add marshmallow fluff and peanut butter. Stir until smooth. Stir in vanilla and peanuts. Cool completely and 8 oz. containers of cool whip. Layer ⅓ of the brownies squares on the bottom of a trifle bowl. Next cover with ⅓ of the nugget filling. Next spoon ½ of the caramel topping over nugget. Spoon ½ of the cool whip over the caramel. Repeat this process; brownie, nugget, caramel, and cool whip for the second layer. For the last layer, layer remaining brownie drizzled with remaining nugget. Top with peanuts if you like. I used to adore Snickers growing up, you're right - they have all the elements for such a great candy bar! You had me at snickers! My family is going to love me, thanks Nikki! marshmallow fluff is air whipped into liquid marshmallows & put in a jar (container). Hey, Nikki, I hope to make this for Christmas dessert, but I'm unclear about part of the directions. In the nougat layer you say: "Cool completely and 8-oz. containers of cool whip." Do you mean to add a container of cool whip to the nougat mixture after it cools? Please clarify. Thank you. Can the nougat part be made a day ahead and refrigerated until ready to layer?